When it’s your first year teaching, you can use all the help you can get, especially in a room full of kindergartners. “There’s no one to fall back on. They have to really find it for themselves,” says Pine Lane Assistant Principal Candice Laviaguerre. It’s not much easier when you are teaching second graders and you have some more life experience. Kindergarten teacher Courtney Hall just graduated from the University of Wyoming. Second grade teacher Beth Hall is in her first year of full-time teaching. She’s had experience as a substitute and in other careers as well. “They’re on two ends of the spectrum as a new teacher could be,” says Laviaguerre. These two first-year teachers have quickly learned that they can rely on each other. “That was really exciting. It was not something we expected,” says Beth Hall. “She sees two years later where they should end up and kind of gives me those ideas of classroom management and how to really work with them to get them to this point,” the younger Courtney says of Beth. It’s a friendship that is rare to find, but so is there situation. “I’m kind of jealous. I would love to have that opportunity,” says Laviaguerre. It’s the opportunity to work with your mom. “I hope you like your mom,” Courtney Hall heard when she was hired just days after her mom Beth this summer. Thankfully Beth and Courtney Hall do like each other. They eat lunch together. They celebrate birthdays with balloons and banners. They don’t take their time together for granted. Like any job, most people like to leave work at work. Beth and Courtney prefer to bring it home. Courtney is living with mom and she gets settled in her new career. So naturally they keep talking about work. “The rest of the family is kind of annoyed with us, but we honestly talk about school,” says Courtney. Their love for school stems from their love for their community. They are firmly rooted in Douglas County. “We watched Cimarron and Legend get built,” says Beth. “Our family actually named Cimarron.” Courtney was a cheerleader for four years at Legend. Beth was a SAC member for several schools. A Master of Education degree along with the Boettcher Residency Program helped her become a full-time teacher. 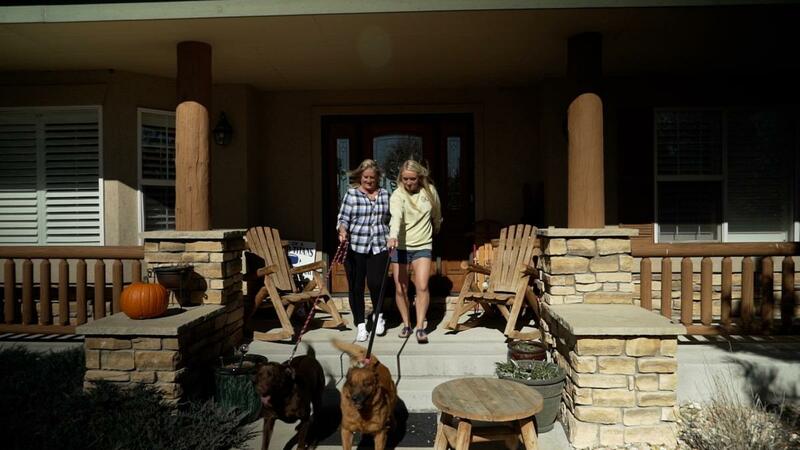 As the mother and daughter walk the dogs along their dirt road in Parker, they do what they’ve always done - talk about their students. “I think I can make a difference with kids,” says Beth. Courtney agrees. “I love it. This is what I’m supposed to be doing the rest of my life."